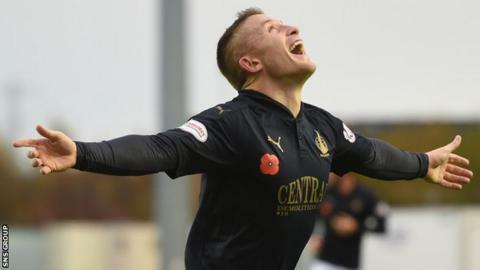 John Baird scored a first-half hat-trick as Falkirk swept Alloa aside to move to within one point of second place in the Championship. Bob McHugh and Luke Leahy added goals after the interval in a one-sided contest. Peter Houston's side have lost just twice in the league this season, to the teams above them: Hibs and Rangers. The struggling Wasps remain rooted to the bottom of the table - five points adrift of ninth place. Falkirk took a 12th-minute lead when the prolific Baird was sent clear by Mark Kerr's long pass and slammed home. The striker found the net once more when he linked up with Craig Sibbald and after the midfielder's shot was blocked he followed up to score his 12th goal of the season. And his treble was completed from Sibbald's corner after Blair Alston's long-range blast was blocked by defender Kyle McAusland. It was Baird's eighth goal in four games. Home keeper Danny Rogers did well to deny Michael Chopra and Mark Williams before McHugh made it 4-0 from close range after Leahy's ball in. Rogers made an excellent save from Scott Hynd and Leahy rounded off a convincing win with a good header from Aaron Muirhead's cross. Match ends, Falkirk 5, Alloa Athletic 0. Second Half ends, Falkirk 5, Alloa Athletic 0. Corner, Falkirk. Conceded by Dougie Hill. Aaron Muirhead (Falkirk) hits the right post with a right footed shot from the centre of the box. Corner, Falkirk. Conceded by Kyle McAusland. Attempt blocked. Robert McHugh (Falkirk) right footed shot from the centre of the box is blocked. Ryan Sinnamon (Falkirk) wins a free kick on the left wing. Attempt missed. John Baird (Falkirk) left footed shot from the centre of the box is just a bit too high. Goal! Falkirk 5, Alloa Athletic 0. Luke Leahy (Falkirk) header from the left side of the six yard box to the bottom right corner. Assisted by Aaron Muirhead with a cross. Corner, Alloa Athletic. Conceded by Danny Rogers. Attempt saved. Scott Hynd (Alloa Athletic) right footed shot from the centre of the box is saved in the top centre of the goal. Attempt saved. Aaron Muirhead (Falkirk) header from the centre of the box is saved in the top centre of the goal. Corner, Falkirk. Conceded by Andy McNeil. Attempt saved. Will Vaulks (Falkirk) right footed shot from the centre of the box is saved in the bottom right corner. Substitution, Alloa Athletic. Michael Hardie replaces Robbie Crawford. Substitution, Alloa Athletic. Scott Hynd replaces Burton O'Brien. Substitution, Falkirk. Ryan Sinnamon replaces Paul Watson. Michael Chopra (Alloa Athletic) wins a free kick in the defensive half. Corner, Falkirk. Conceded by Mikk Reintam. Attempt blocked. Mark Kerr (Falkirk) right footed shot from outside the box is blocked. Goal! Falkirk 4, Alloa Athletic 0. Robert McHugh (Falkirk) right footed shot from very close range to the bottom right corner. Assisted by Luke Leahy. Attempt missed. Robbie Crawford (Alloa Athletic) right footed shot from the centre of the box is close, but misses to the left. Attempt missed. John Baird (Falkirk) header from the centre of the box is high and wide to the left. Attempt saved. Mark Williams (Alloa Athletic) right footed shot from the centre of the box is saved in the bottom left corner. Dougie Hill (Alloa Athletic) is shown the yellow card.